The post positions for Sunday's $1 million Queen's Plate Stakes were selected during a special breakfast ceremony on Thursday morning. Due to cold wet weather all week, the connections, media, and officials gathered at the trackside tent for the proceedings rather than the walking ring where the draw is usually held. This year marks the 149th edition of the Plate, the oldest continuously-run stakes race in North America. 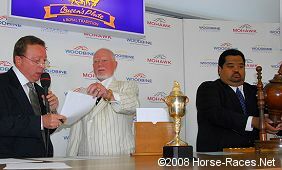 It is the premier race for Canadian-foaled 3-year-olds, the first leg of the Canadian Triple Crown, and is contested at 1 1/4 miles over the Polytrack at Woodbine Racetrack in Toronto. Colts and geldings carry the standard weight of 126 pounds while the filly Ginger Brew gets a 5 pound allowance. Like at the Kentucky Derby, selection order is determined using a double-blind random draw of numbered pills and entry forms. This year, CBC Sports hockey personality Don Cherry assisted racing secretary Steve Lym and track announcer Dan Loiselle in drawing the selection order. Loiselle mentioned that Don Cherry, host of the Coach's Corner segment on Hockey Night in Canada, was selected as the 7th greatest Canadian of all-time in a CBC poll several years ago, ahead of such figures as Sir John A. Macdonald, the first prime minister, and Alexander Graham Bell, inventor of the telephone. Cherry said, "The only reason why I was voted for greatest Canadian is that all the people wanted to piss off the CBC." He also joked that there aren't any great Swedish thoroughbreds because "Everybody knows Swedes don't like going around the corners!" Cherry did not pull any punches in his criticism of the current Toronto Maple Leafs, who have missed the playoffs 3 years in a row, and expressed disappointment that popular player Doug Gilmour was not voted into the Hockey Hall of Fame this year. 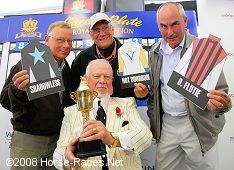 Drawing the selection order with track announcer Dan Loiselle, honorary drawmaster Don Cherry, and racing secretary Steve Lym. After a 5 minute discussion period, a representative for each horse has 90 seconds to come up on stage to select the post, by hanging the owner's colors on the board. 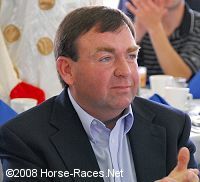 Track announcer Dan Loiselle briefly interviewed the trainer or owner who made the selection. 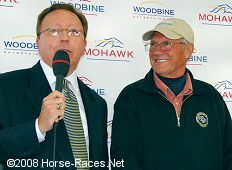 Dan Loiselle and trainer Roger Attfield. Trainer Roger Attfield, looking to win his record-tying 8th Queen's Plate with Plate Trial winner Not Bourbon, selecting 12th chose post 13 for the 3-1 morning line favorite. 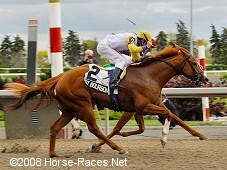 Attfield said, "I'm not going to LongRun (racehorse retirement program) yet, as they don't take stallions! I'm not worried about the distance with his pedigree, I'm more concerned with his style of running. We've just got to get him settled." Poking fun at the names of the Stronach horses, Ginger Brew and Jungle Brew, Attfield said, "There's nothing wrong with a good brew but it's not bourbon!" Regular rider Jono Jones will be in the irons on Sunday. Post time for the Plate will be 5:06 PM ET on Sunday June 22 and the race will be televised on CBC in high definition from 4:30 - 5:30, as well as simulcast to many locations throughout North America. Ron MacLean, who hosts Coach's Corner with Don Cherry, will host the CBC telecast. The Plate will be carded as race 9, and there are thwo stakes races on the undercard, the $200,000 Scotts Highlander Stakes (G3) for older horses sprinting 6 furlongs on the turf and the $150,000 Singspiel Stakes (G3) for older horses at 1 1/2 miles on the turf. Free past performances are available from BRISnet.com. 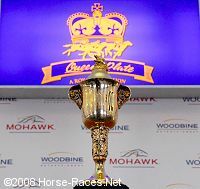 Who will win the Queen's Plate? Left: Trainer H. James Bond has Solitaire, who finished second to Not Bourbon in the Trial and will break from post 12 as the 7-2 second choice on the morning line. Bond said, "He can still improve. He ran really well (in the Trial) so he'll get the extra furlong. He has the pedigree, and he's training great last couple of days. He trains really well (at home at Saratoga)." Robert Landry gets the call again in the Plate. 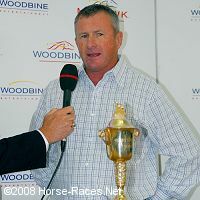 Right: Trainer Brian Lynch selected post 10 for Woodbine Oaks winner Ginger Brew, a Frank Stronach homebred, who is the 4-1 third choice on the morning line. Lynch said of the 2 weeks between the Oaks and Plate, "I wish I could give her 2 months! I don't really have any concerns. She came out of the Oaks good enough so let's see what she has. She's been acting good since the Oaks, so we'll give it a shot." Regular rider Javier Castellano has the mount. 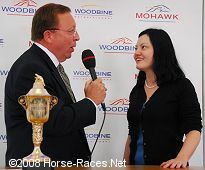 Dan Loiselle and owner-breeder Heather Takahashi. Takahashi selected post 9 for her 20-1 longshot Shadowless. The dam, Life in Fiction, was the first horse Takahashi owned, and Shadowless, a gelded son of Stormy Atlantic, is the first foal she ever bred. She said, "First horse I've bred, first horse I've raced, his mother was the first horse I owned. We were really pleased with the last race (3rd in an allowance). He had lots of reasons not to win. He bolted out of the gate. He was pretty rank and was wide into the homestretch. We think he'll improve on that." Regular rider Emma-Jayne Wilson, who won last year's Plate aboard Mike Fox, will be in the irons for trainer David Bell. Not Bourbon winning the Plate Trial.